Make the first meal of the day serve up big gains with these high protein pancake and breakfast bar recipes! Move over breakfast buffet. An indulgent morning meal doesn't have to come off a rolling cart, include something fried or overly sweet, or be served up by the baker's dozen. All you need to whip up a decadent breakfast at home is a bit of baking soda, oats, spice, fruits, nuts, and, of course, protein powder! Add these BPI athletes' favorite recipes to your protein repertoire for a healthier take on filling breakfast options—we're talking muffins, pancakes, and even cookies. These recipes are so indulgent you might be tempted to eat them more than once a day. Well, no one said you can't have breakfast for dinner, right? Who doesn't love a batch of warm oatmeal cookies straight from the oven? Upgrade the old family recipe of two sticks of butter and a full cup of sugar to this healthy alternative. Make the smart swap of applesauce for butter and kick this protein powerhouse of oats and egg whites up a notch with eight scoops of protein powder. Not all muffins lead to that infamous muffin top. This time, think smart when you crave a carb-filled treat. Not only are these muffins rich in protein, but they're also packed with antioxidant-rich blueberries, potassium-filled bananas, and heart-healthy walnuts. When it comes to cooking, I like to keep it quick, simple, and nutritious. Why not get the most of each meal by kicking the protein percentage to the max? 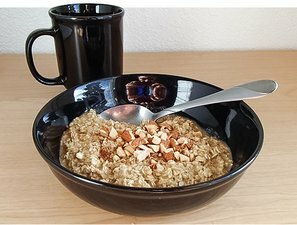 I like to add protein powder into my oatmeal, and then pack in more flavor by topping it with almonds. Way too many protein bars are actually glorified candy bars packed with sugar and additives. Enjoy the delicious combination of peanut butter and white chocolate with this recipe. Throw them in your bag for an easy snack on the go. Tired of drinking your whey by the scoopful? Try these muffins instead. With a healthy dose of oats and a serving of chocolate whey—finished off with a few chocolate chips—these breakfast alternatives taste more like a cheat meal. Forget the flakes; it's always been about the clusters. Instead of digging through a box of cereal and gobbling down sugar-filled granola, make your own healthy version. These clusters are packed with protein, capture the seasonal taste of pumpkin, and are held together by the sticky goodness of peanut butter. Yum!